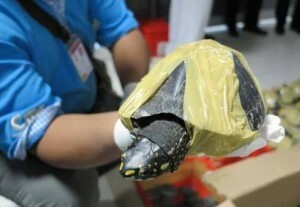 The rare turtles, destined for Kuala Lumpur, were packed tightly into cardboard boxes sealed shut with duct tape. By the time Pakistani wildlife officials in Karachi discovered them, all but 13 the 62 freshwater turtles had suffocated through a lack of oxygen. “They were wrapped in such a way that they could not breathe,” noted Adnan Mehmood, head of marine conservation at the local wildlife department. 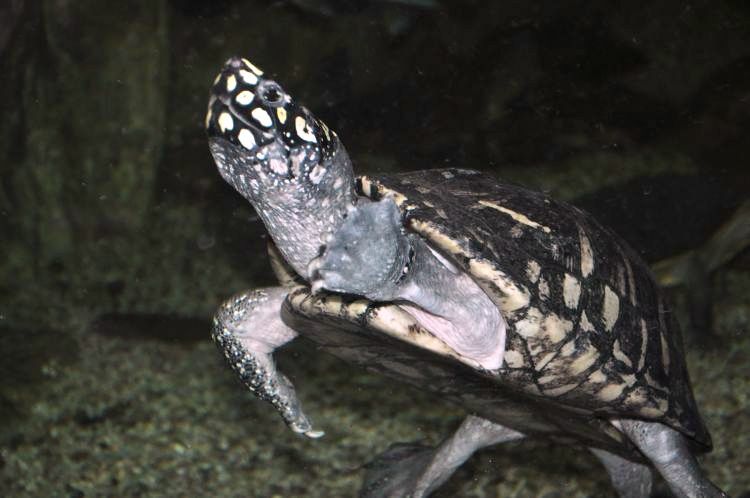 The endangered Indian black spotted pond turtles (Geoclemys hamiltonii), which were once common around the Indus river area, would have been worth around 10 million Pakistani rupees (RM373,269 or over $95,000) on the black market, according to Pakistani officials. In some Southeast Asian countries, these turtles can each sell for up $2,000 (RM7,800). The 62 reptiles were on their way by airmail to Malaysia, where they would likely have wound up being kept as pets, consumed as exotic meat, or used as ingredients in traditional medicine. The 13 survivors. all of which were breeding-aged females, were released into a nearby lake by local wildlife officials. The traffickers behind the confiscated shipment remain at large. The booming illegal trade across the region in the medium-sized pretty-looking spotted reptiles, whose sale without a license is prohibited by the Convention on International Trade in Endangered Species of Wild Flora and Fauna (CITES), has alarmed conservationists. Over the past few years alone, thousands of black spotted turtles have been confiscated, according to the anti-trafficking watchdog TRAFFIC. In Karachi numerous live turtles and body parts of dead ones have been confiscated at the city’s airport and seaport over the past two years. Most of the small turtles are smuggled by passengers who conceal them in their luggage, routinely without a care for the well-being of the animals. Many of the turtles never make it through grueling journeys at the bottom of suitcases or packed into tight containers. As all trades, wildlife trafficking, too, responds to demand. And demand for endangered freshwater turtles remain high from Thailand to Malaysia to Hong Kong. “Turtle species are seriously threatened [and] nowhere more so than in Asia with 17 of the 25 most critically endangered tortoises and freshwater turtles on the IUCN Red List found in the region,” said James Tallant, a senior program officer for the International Union for Conservation of Nature and Natural Resources. TRAFFIC has called for “immediate action” to “stem the flow” of the illegal cross-border trade in endangered turtles.